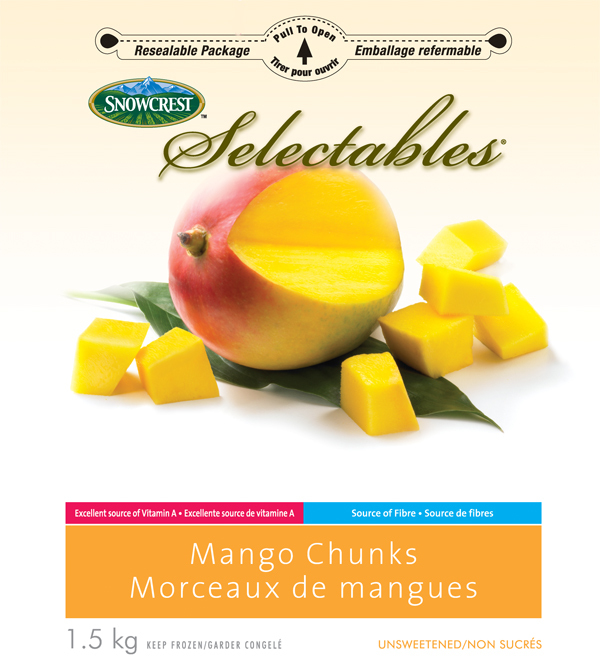 Mango Chunks - 1.5 kg - Snowcrest Foods Ltd.
Snowcrest™ Selectables® Mango Chunks are only harvested when fully ripe at their peak. Each Mango is delicately picked, washed, peeled, cut into pieces and flash frozen within hours of harvesting, allowing it to retaining its just-picked flavour. They are ideal for smoothies or as a topping on yogurt, cereal and ice cream. Serve them slightly thawed on their own as a snack, or use them to create glazes and sauces. Try Snowcrest™ Selectables® Mango Chunks in the Carrot Mango Sweet Bread. According to new research study, mango fruit has been found to protect against colon, breast, and prostate cancers and leukemia. 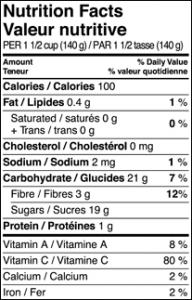 Several trial studies suggest that polyphenolic anti-oxidant compounds in mango are known to offer protection against breast and colon cancers. Mango is a very rich source of potassium. Potassium is an important component of cell and body fluids that helps controlling heart rate and blood pressure.